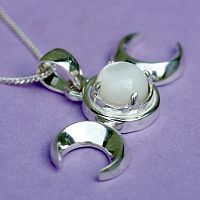 - When you gaze up into the night sky to spot the moon floating above the clouds, does it send shivers down your spine? Does your pulse quicken when you are touched by its silvery light? Do you feel your senses sharpen until you could swear you are one with the surrounding night? This isn't madness; this is magic! A lustrous mother-of-pearl cabochon is the highlight of this silver moon necklace, and it is surrounded on either side by two crescents, one waxing and one waning. 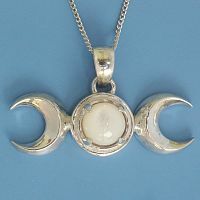 This is the Triple Moon symbol, which pagans and wiccans use to represent the Goddess in her forms of Maiden, Mother, and Crone. 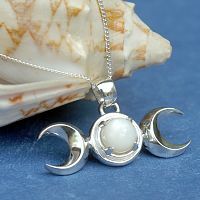 Our Triple Moon Pendant measures 7/8" tall, including the bail. It comes with an 18" sterling silver chain. Do you have any other questions about our Silver Triple Moon Pendant with Mother of Pearl?